We'll bet your local drive-thru doesn't offer a breakfast sammich of this caliber. 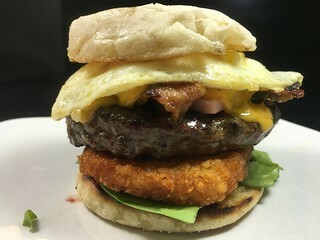 We start with a half pound of beef and an egg topped with ham, bacon, hashbrowns, spinach and melted cheddar cheese. It's all piled high on a tasty english muffin. So come get your breakfast on... available any hour the mood strikes you!